Blepharitis is a condition where the eyelids are chronically swollen. While it usually resolves without incident within two to four weeks, it can recur over and over again. This frustrating problem is usually uncomfortable and unattractive, in addition to possibly blurring the patient’s vision and putting them at risk of more serious eye problems if left untreated. If you or a loved one is struggling with blepharitis, understanding the details of the condition, treatment and the prevention methods used will help guide your self-care plan and set your mind at ease. Blepharitis is commonly misdiagnosed among the general population as conjunctivitis, which is inflammation of the pink, moist flesh surrounding the eye. Blepharitis is a swelling of the eyelid skin, whether it’s the upper, lower or both. Most cases are along the lash line, but it is possible for the swelling to show elsewhere on the lids or even encompass the entire lid. Most cases involve just one eye, but it’s possible for both eyes to be affected. In addition to swelling, the normal tear production of the eye may be impacted. This can cause watery, running eyes and blurry vision. You may note a thick, gooey discharge from the eye, especially after waking up in the morning. The eye may feel sticky or gluey when you blink. A hard crust of discharge may form in the lash line. If this crust gets into the eye, the sufferer may experience the feeling of a foreign body in the eye. Itchiness and a burning sensation are also common. Those with blepharitis may also note aesthetic changes, such as a greasy look and feel to their eyelids. This is caused when the eye overproduces skin oils. There may also be skin flaking or redness in the white (sclera) of the eye from the irritation. In some cases, a pimple-like growth may grow, as blepharitis escalates into a sty or chalazion. The eyelashes may break off or fall out as well, only to grow back once the blepharitis has resolved. Finally, those with blepharitis may notice an increase in blinking and the onset of photophobia. Bright lights may become especially jarring, and long-term computer use may become difficult. These effects are temporary and should resolve as the inflammation abates. Staph infection. 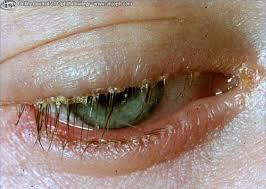 Staphylococcal blepharitis is caused by bacteria. Sufferers of a staph infection may note a ring-shaped inflammation around the root shafts of the eyelashes, in addition to burning and itching. Antibiotics and steroids are usually prescribed to both fight the infection and reduce the swelling. It’s not uncommon for staph to recur, sometimes beginning in childhood and continuing into adulthood. Rosacea-induced, posterior blepharitis. Rosacea can affect the eye’s oil glands. As the glands overproduce skin oil (sebum), the glands can become blocked. The backed-up oils can then form a swollen growth, similar to a pimple. For severe cases, this may need to be drained. For more minor cases, scrupulous lid hygiene and warm compresses may be all that’s needed. Antibiotics may be prescribed to avoid infection. Seborrheic Blepharitis. Characterized by an excessive discharge of oil/grease from the skin around the eyelids. It is usually accompanied by similarly greasy hair and skin. There are other, less-common reasons for forming blepharitis. Allergies can cause itchy, swollen eyes that are only irritated further by rubbing. In these cases, allergy medication can bring relief and resolve the blepharitis entirely. For others, their eyelashes are host to demodex, a type of microscopic parasite responsible for mange in dogs and cats. This can be treated and cured entirely with a combination of medications, good housekeeping and scrupulous hygiene. Lastly, a fungal infection may to blame. This is usually only a concern for those with severely compromised immune systems, such as those with AIDS and low T-cell count, organ transplant recipients and the extremely aged. Anti-fungal medication and good lid hygiene are used to resolve these cases. Your doctor or eye care professional can diagnose blepharitis by inspecting the lids. Unless your eye is extremely painful, it’s probably not necessary to go to the hospital. Sometimes, a sample of your tears will be taken to test for fungus or bacteria. Medication therapy usually begins immediately after diagnosis, and you can expect to feel relief from your symptoms within a few days. Once diagnosed, you will likely be prescribed eye drops, oral medications or a combination of both to fight infection and reduce inflammation. Following your medication routine as directed isn’t all you need to do, however. There are steps you can take to speed your recovery time, depending on the origin of your blepharitis. Lid hygiene. Twice a day, mix one drop of no-tears baby shampoo into a cup of very warm water. Use this mixture and a soft washcloth to gently and thoroughly wash your eyelids. If a crust is forming, use a very warm compress of plain water for a few minutes before washing your lids. This will help ease discomfort and make the crust easier to wipe away. Never use harsher soaps on your eyelids, as this will strip away all the skin oils and leave you susceptible to dry, itchy, irritated lids. Housekeeping protocols. 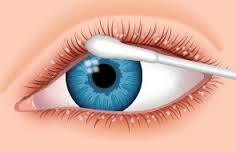 You will want to change to a fresh pillowcase every night when you are experiencing a bout of blepharitis. This can help stop the irritation from spreading to your other eye and it will also help stop the irritant from being reintroduced into the affected eye as you sleep. If your blepharitis is being caused by demodex, you will want to change your bedding daily and encase your mattress in a mite-proof protective cover. Behavioral changes. There are two big changes you can make to help your eyelids recover and stop a recurrence before it starts. First, train yourself to stop touching your eyes. If you need to attend to your contact lenses, flush out an irritant or pluck out an errant eyelash, do so only after carefully scrubbing your hands. Second, give up eye makeup. Makeup can clog the oil glands in your eyelids and flake off into your tear film. Both can cause raging blepharitis and leave you open to infections and corneal scarring. Once your blepharitis has resolved, you should continue the same protocols you used to get rid of it to prevent a recurrence. Continue to wash your lids carefully twice a day, avoid makeup and do not touch your eyes with anything but scrupulously clean hands. Your bedding can be changed every few days if you don’t wish to do it daily, but don’t allow any pillowcase to linger longer than three days before it’s washed. If your blepharitis was caused by fungus, talk to your doctor about boosting your immune system with lifestyle and dietary changes to avoid a recurrence. Blepharitis is a condition with many causal factors and available treatments. You can do your part to heal the irritation and swelling and avoiding it in the future by paying close attention to lid hygiene, housekeeping and your behaviors. If you are new to contact lenses, your Optometrist will diagnose this condition when he performs a contact lens fitting examination. Typically, they will want to resolve the blepharitis (depending on the severity) , before proceeding with contact lenses. In some mild cases, they may recommend daily contact lenses, as these are less likely to get heavily deposited and cause complications, as they are swapped each day ofr a new pair. Even so, wearing time can be shortened, due to discomfort. If you develop blepharitis while wearing contact lenses, you should discontinue wearing your contacts until the blepharitis has been successfully treated. Wearing contacts when you have eyelid inflammation can result in bacteria and other debris sticking to your lenses and causing pink eye or potentially more serious eye diseases.